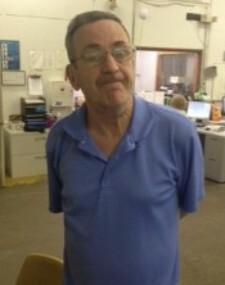 Pat currently works at DSC as a materials handler, although he stated that he would like to work in a kitchen again. Pat said that he enjoyed the time spent working toasting buns at a restaurant on Neil Street an number of years ago. Pat expressed that he enjoys cooking and eating. Some of his favorite foods are steak, chili dogs, and hot dogs. One of the places he likes to go out to eat is at Chili’s because they have great food there. He also enjoys going out to the Carmike Theater with friends to see action movies. Some of the other activities he likes doing is bowling, mini golf, games, and attending car shows. Pat really enjoys baseball and football. He said that he watches the games on TV, however, he would like to get out to more of the local high school and college games. Pat stated that he has been to places such as California, Pittsburgh, and Niagara Falls with his family. He would love to go back to visit California someday too!